Just over two weeks ago Turkey “celebrated” that nerve-wracking failed attempt at a coup d’état of last July. It was an anniversary one imagines someone within Turkey could hardly have ignored even had they tried, but almost the same was true in much of the rest of Europe in view of the various Turkish government ministers sent out (most of them unsuccessfully) to harangue the assembled diaspora faithful in various foreign cities that day. Still, today marks another important attempted-coup milestone in that the first major trial of alleged coup-plotters begins in the Turkish capital Ankara, to take place in fact in a new court-building specifically built for the purpose. A total of 486 defendants are to be put on trial at the same time (although 27 of those are being tried in absentia). The BBC earlier today had live audio of the scene as those defendants were first led handcuffed into the courtroom: apparently, 438 “accusers” (e.g. family-members of those killed resisting the coup) were also present to greet them, and the yelling and jeering at the prisoners filing in was clearly audible. Not something that would be permitted by the judge in any Western courtroom, to be sure . . . but then, these proceedings are unlikely to have as their aim the true pursuit of justice. Along the same lines, it’s clear the massive clearing-out of opponents of any stripe that President Erdogan conducted in the coup-attempt’s wake has gone far beyond any attempt merely to find and punish those parties directly involved. Inquiring minds still might want to know, despite no one there on the scene seeming too terribly interested: Who truly was responsible for trying to overthrow Erdogan’s government? 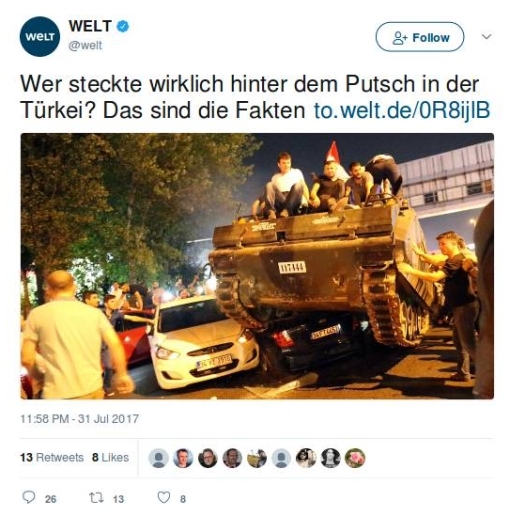 Die Welt steps up to have a crack at the question. “These are the facts”: Turkey is distinguished these days by its fierce enemies, not only the separatist Kurd organization PKK, but also ISIL and the Gülenist movement headed by a Muslim cleric safely in exile in Pennsylvania, USA. Nonetheless, the main responsibility for the coup cannot really be ascribed to either of those two first-named actors, using dog-chasing-car logic: If they were actually able to take over the Turkish state, what could they really do with it? – although there are accusations against some of the accused of affiliation or at least sympathy with the PKK. No, the Gülenist thread must be most fruitful for pursuing criminal intent to overthrow (and kill) Erdogan, and this is what reporter Boris Kálnoky pursues here. After all, it wasn’t that many years ago (say, up to 2012) that Fethullah Gülen was actually a close friend and political ally to Erdogan, so that his own followers had plenty of time to insinuate themselves on a widespread basis into the main Turkish state institutions. Truly, then, it may well have been the Gülenists behind 15 July 2016. Kálnoky remains unconvinced, however. Oh, he gives plenty of juicy Gülen-related details here, mostly revolving around a Gülenist imam by the name of Adil Öksüz – who, unfortunately for the Turkish authorities, is one of those who got away and so is being tried in Ankara now in absentia. It was he who allegedly carried out the key go-between role between Gülen in the US and those who would go on to carry out the coup. For one thing, Gülen himself has conceded in a press-interview that he did meet with Öksüz in the US. On the other side, Öksüz is said by other witnesses to have met secretly with 30 military officers in Ankara on 6 July to give them the green light and go over the details of the coup plan. The Gülen-thesis of the accusation founders on certain confessions that might have been extracted by force, as well as on hard-to-verify declarations from in some cases “secret” witnesses. And anyway, that is all pretty much beside the point; Kálnoky rightly reminds us at the end that what we really have developing in front of our eyes in this specially-built Ankara courtroom is but a “classic show-trial” (i.e. in the old Communist sense) meant to arrive at predetermined political conclusions. It will be a long time, if ever, before any fair-minded investigator will have the sort of untrammeled access to witnesses and materials in Turkey to try to figure out the actual truth. In the meantime, perhaps we can rely on the proxy of the US Government’s attitude towards last year’s July coup-attempt: it has steadfastly refused to conclude that any evidence against Gülen adds up to the point that his forced extradition to Turkey is called for.